100% Song of the South free. I promise. There is no other company with the marketing power of the Walt Disney Company. Coca-Cola probably comes the closest in terms of packaging “stuff” and selling it to us as happiness, but you don’t see many babies with Coke cans hanging from their mobiles in their crib. Disney touts their animated library as though it’s flawless, timeless, and owning every title will bring you happiness; they do this to the extent that it becomes taken for granted that all their movies are incredible. But some of the films that are touted as legends (and that come in and out of “the vault” so that you’d BETTER buy it when it’s released) are, in my opinion, not particularly good. Meanwhile there’s some really good stuff flying under the radar (which is shaped like mouse ears) that doesn’t get the push it deserves. I put together this little list of five Disney animated films that I just don’t hear anyone talking about -- particularly Disney themselves. I think these five movies are underappreciated and underrated. When Disney goes out of their way to promote direct-to-video sequels like Return to Neverland and The Little Mermaid II (Underwater Boogaloo) as “must-haves,” I want to raise my hand politely…and then slap somebody with it. You remember when David Spade was funny? I mean…it’s been a while. 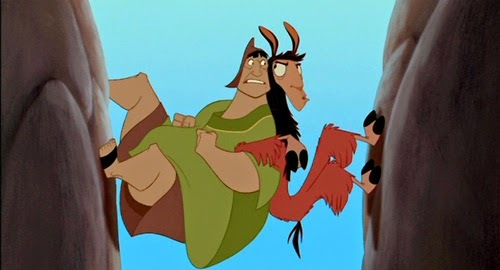 In fact, when the unfortunately-titled The Emperor’s New Groove debuted in 2000 he had pretty much already peaked. The movie is essentially a buddy comedy featuring Spade as an Incan emperor and John Goodman as a peasant and also features Eartha Kitt as a witch and Disney stalwart Patrick Warburton as her assistant. The plot has Spade (spoiled and selfish) and Goodman (humble and kind) thrown into a perilous situation together and essentially trying to survive the South American wilderness, learning a little bit about each other…and a lot about life. It’s cheesy, yes. But it’s also funny and different. At least I’ve always thought so. Disney was trying something deliberately different here. This was an attempt to break free from the musical fairy tale thing that had been the bread and butter of the company for so long and I appreciated the effort. The animation style was very stylized and seems, in a lot of ways, to be a throwback to the more angular art trends of the 1950s. The Emperor’s New Groove has a storied history. It was originally intended to be Kingdom of the Sun -- the same, traditional feel-good cartoon that Disney has made dozens of times -- but production and a lack of direction slowed things down and even stopped production for a few months. Sting, that dude from The Police who would prefer that you don’t stand so close to him, wrote a soundtrack full of songs for the movie, most of which were dropped (thank God) when the film was reworked into a buddy comedy. He wasn’t happy. He angrily played his lute for weeks. The film eventually went on to be a modest financial success. It was followed by a direct-to-DVD sequel (of course it was) and even a Saturday morning television series. Yet, it seems to have fallen off the radar almost completely. It’s out on a double-feature Blu-ray with the aforementioned sequel but it seems that, for the most part, the House of Mouse would like to make what money there is to be made from it and then forget that it ever happened. 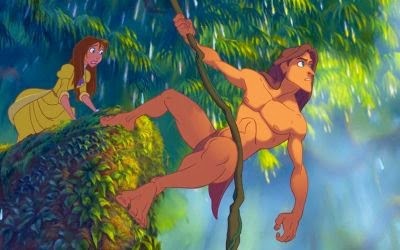 Tarzan was the last Disney film for a decade that attempted to follow the traditional formula of taking a familiar story from myth or literature and injecting it with heart (and songs). It featured music by Phil Collins and had Rosie O’Donnell as a gorilla. Here’s the thing: I pretty much hate Phil Collins, can’t stand Rosie O’Donnell and have never had even a passing interest in Tarzan stories. Yet I really like Disney’s Tarzan. So that’s good, right? Disney was at the tail-end of what has now been dubbed “The Disney Renaissance,” a return to former greatness that started with The Little Mermaid and followed through Aladdin, Beauty and the Beast and The Lion King. The films had grown progressively less profitable and artistically successful as the ‘90s drew to a close, culminating with Tarzan, which was very successful commercially but seems to have had little lasting legacy. With the dawn of the new millennium, Disney switched their focus away from traditional cel animation and looked to CGI and unconventional storytelling as the future. Like Treasure Island, but IN SPACE! And called Treasure PLANET! So cutting edge. It would be a decade before they tried another hand-drawn animated film in the classic Disney style (2009’s The Princess and the Frog). This classic entry is here for my street cred. Disney Animation was running on a skeleton crew during World War II because most of the animators were overseas in the conflict. Classic Disney took a break between 1942 (Bambi) and 1950 (Cinderella) and for eight years cranked out anthology cartoons featuring shorts that were united by a theme (such as music). I think the two I like the best out of these was Make Mine Music (1946) and Melody Time (1947), but I give the edge to the former. When I was growing up in the ‘80s, a lot of the segments from these anthologies were being chopped up and released separately. I didn’t see Make Mine Music until I was at least 20, but I had somehow seen several of the segments growing up, probably on The Disney Channel when we got a free preview weekend. “Peter and the Wolf” (set to classical music), “Casey at Bat” and “The Whale Who Wanted to Sing at the Met” all come from Make Mine Music. Unfortunately, the lasting legacy of the film now seems to be the complete removal of one of the segments from home video release. “The Martins and the Coys” was a comedic and musical re-telling of the Hatfields and McCoys story that featured animated violence which is apparently so upsetting for Americans (pie-eating prudes) that it’s been completely removed from all Region 1 DVD releases. Even with that edit, Make Mine Music is a classic that rises far above the limitations from which it was created and deserves a lot more attention. This film was an attempt to bring the spirit of the early Disney shorts to a full-length movie, and if I’m not incorrect I believe this is the ONLY full-length movie to star Mickey, Donald, and Goofy. The only other film I can think of that had these guys in it was 1947’s Fun and Fancy Free which had the “Mickey and the Beanstalk” segment, but that movie also featured other segments without those guys. 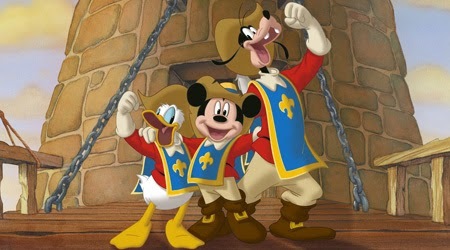 The Three Musketeers features Mickey and Minnie Mouse, Donald and Daisy Duck, Goofy, Pluto, Clarabelle the cow, and even brings back Pete (complete with a peg leg), the villain from a lot of those early black-and-white theatrical shorts. It feels timeless; it’s full of the same types of gags and the spirit of those classic Mickey cartoons and even features songs that utilize classical music while providing new lyrics. I’m not sure who the audience for this was. I imagine it was aimed at two core Disney markets: 1) young kids (the goal being to introduce them the classic Disney characters which had been under-utilized), and 2) adult animation buffs who had nostalgia for the characters from their own childhood. I’m not sure what happened, though, because the film wasn’t given a theatrical release and came to DVD with little fanfare. In the decade since it first plopped onto shelves there has been no Blu-ray release and I have neither seen nor heard any mention of its existence since. It’s as if it never was, which is a shame: I think it’s one of the best things to come out of Disney in a long time. It’s only recently in the last year or so that Disney has once again begun promoting Mickey Mouse as a flagship character. You’d think the company was made on princesses alone. Luckily this film is still being manufactured and you can find it online easily and cheaply. Hercules was the movie that got me back into Disney animation after I thought I’d outgrown it. I distinctly remember the conversation I had with a friend that year. I was working at a grocery store, stocking milk and dairy, when one of my co-workers was talking about how much he loved The Hunchback of Notre Dame. I couldn’t believe what he was talking about. We were ADULTS, man! We were out in the world, earning our pay and forging a path for ourselves in a brave new world after high school. What was he doing watching cartoons? He informed me that I was ridiculously wrong and that the next Disney animated movie to come out was going to be Hercules and that I should give it a chance. 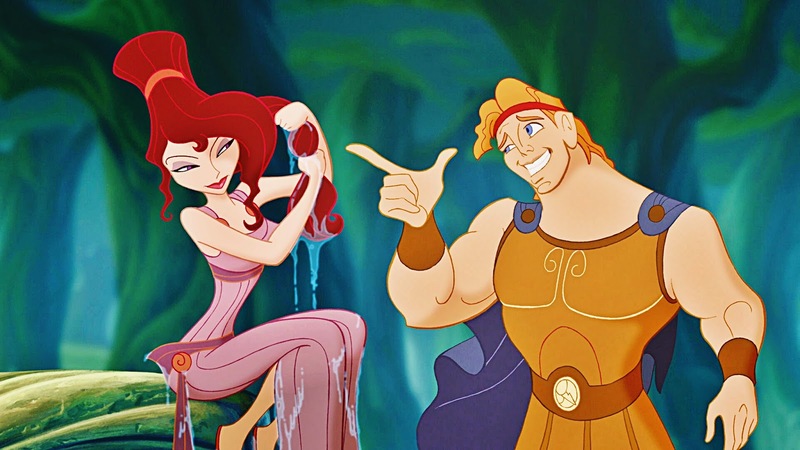 He compelled me enough to give it a shot, and when I saw Hercules in theaters during the summer of 1997 I fell in love with the extremely stylized animation and the way the film didn’t take itself nearly as seriously as all the Disney classics with which I’d grown up. I sat in my college Algebra class drawing little doodles of Hades (and failing the course) and eventually found myself completely obsessed with Disney animation as I went back and tracked down all the movies I’d missed and began accumulating an extensive VHS collection. My affection for Hercules surely must be informed by the circumstances surrounding it, but I also think it’s a genuinely great movie. By taking the traditional story of the mythological hero and adding a healthy dose of real-world cynicism (but not too much) thanks to the casting of James Woods -- plus a love interest who’s more femme fatale than damsel in distress -- Disney subverted their own formula and gave us something truly different. Hercules is another film that Disney seems to have forgotten it made because it apparently isn’t particularly marketable (though I’d argue that point, given today’s hunger for all things superhero). There’s a Blu-ray scheduled for release this summer, almost 17 years after its initial theatrical run. Here’s hoping that with that release comes a push to introduce the characters to a whole new generation. It deserves it. And so do all of these underrated films that have been pushed out of the spotlight to make room for more of the same. A column after my own heart Heath, you pretty much nailed it. I've always thought that Emperor's New Groove and A Goofy Movie were the two DIsney cult classics, endlessly adored by fans but totally shoved out of the lime light of the public eye. Tarzan also just barely misses my own personal Disney top ten. 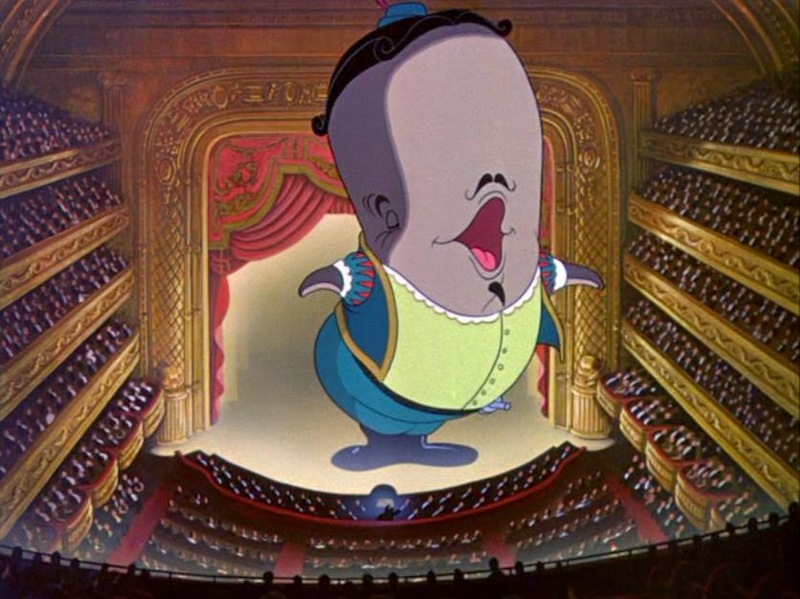 I too am guilty of forgetting about Make Mine Music, even though I absolutely loved Peter and the Wolf and the Operatic Whale when I was a kid. I actually had no idea that Hercules was as underrated as you said. It and Aladdin consistently make my friends' favorite Disney movie nearly every time I ask. I'm aware I'm in the minority for this opinion, but the Disney flick that I think is criminally underrated (although it is a staple of the marketing department) is Lilo & Stitch. My love for it does stem from a nostalgic first viewing, but I've come back to it again and again and am always moved by its story of two outcasts and how they create a family out of turmoil and heartache. I have a hard time being objective about Disney, but they do have an absolutely outstanding catalog any way you look at it. Right there with you on Lilo, Myke. There's this interesting stretch of goofier Disney movies with a heart from that time period that I like just as much as the bigger movies like Beauty & The Beast. A Goofy Movie, Hercules, and Lilo and Stitch are all FANTASTIC. Oddly enough, Rescuers is one of my least favorite in the filmography. Not that I don't like the messages or Evanrude, I'm just never in the mood to watch it. JB and Myke: I also love A Goofy Movie; Adam wrote about the music from that movie recently, though, and I didn't want to infringe. I don't LOVE Lilo and Stitch, which is weird considering my recent obsession with Elvis, but I haven't watched it in years. I need to revisit it. I will say that it doesn't translate well to Disney on Ice. Does anything translate well to Disney on Ice? It feels like even Frozen would be hard pressed to adapt to that mess. I was being glib, but I do think lots of stories/movies lend themselves to Disney on Ice, especially Aladdin, which is probably my favorite. My favorite underrated Disney flicks growing up included in no particular order, The Rescuers, The Black Hole, Flight of the Navigator, Something Wicked This Way Comes, and Treasure Planet. The Black Hole - The ends do not justify the means, and obsession is a sickness that makes it's own private hell. Thanks! I was wild about Flight of the Navigator when I was young. Underrated disney movies? Lilo and Stitch, Treasure Planet, and the Rescuers Down Under come to mind. The Three Musketeers, as far as I know, is developing into a July hit, with now teenagers who watched it as kids rediscovering it, and people who had never heard about it discovering it through Kingdom Hearts and somesuch. I especially like your choice of "Make Mine Music". That film seems almost forgotten these days. I remember during the 80s the Disney channel would often run sections of that film as shorts by themselves. Along with the Pacos Bill and Little Toot sections of "Melody Time" 1948. I also love my fellow readers choice of "The Rescuers" but I have never really seen it as underrated. But since it was made prior to the "Disney Renaissance" it probably does not get the love it deserves. For my own underrated, I would add "The Great Mouse Detective" to the list. Love the love for Hercules. It has one of my favourite lyrics ever: "and his perfect package packed a pair of pretty pecs"... try saying that bugger ten times fast (though not in public... people look at you weirdly if you do, trust me). I just saw Hercules for the first time recently when my daughter wanted to watch it. I was surprised how entertaining it was. And let me jump on the bandwagon with the Lilo & Stitch love, that one is just a gem. Great List! I have watched The Emperor's New Groove so many times. It is so fun to quote and to watch with people who also know it beat for beat. I love the unique humour and the fact it is unlike most other Disney movies. I think it is really fun and I enjoy every time I see it. Tarzan is quite funny as I don't remember how I had seen it before this, but I bought a DVD copy in Spain knowing I really liked it. I did not know this DVD would become one of the most watched things in the house. My siblings loved Tarzan so much that I now know I need to replacement DVD, which is why I have great affection for it. Make Mine Music is so great! I, like you, had only seen bits of it growing up. I had a video of Peter and the Wolf that I loved as a kid. But then I found out about Make Mine Music through this Movie Challenge list that asked how many Disney films you had seen. So I looked that one up, tracked it down and just loved it. I wished I had seen the whole thing instead of just the segments a long time before that. Better late than never though! We had this channel called Disney Cinemagic that used to be on a lot thanks to my younger siblings. The Three Musketeers was played on there a few times. I remember really loving it, and immediately checking when it was on again after it had finished. I really want to re-watch it now! I have always had a love of Hercules. When I was younger I loved the songs and the characters. When I was a bit older, I started to read some Greek mythology, which I have an affection for. As the film was playing a lot, I sat down and re-watched it with a new appreciation of it. I especially loved the joke about Oedipus as I was studying it at the time. There are quite a few versions of the tale of Hercules, but if you know any of them, the joke where you see Scar as a lion-skin is that bit funnier. There is stuff like that throughout the whole movie. You don't have to read Greek mythology to enjoy it but if you have, there are all these little jokes. I love it when films put that little bit extra in there. I agree what the others have said about A Goofy Movie and Lilo and Stitch! Does anyone have an opinion on The Adventures Of Ichabod And Mr Toad? I remember really enjoying this one and thought it was a shame that it never seems to be played on TV over here. I watch "The Adventures Of Ichabod And Mr Toad" most Octobers, just part of my Halloween routine. I have never seen Tarzan, The Emperor's New Groove, or The Three Musketeers. Sounds like I should go check them out. After consulting a list of Disney features I seem to have not seen anything post 1994, save Mulan which is one of my "modern" favorites. 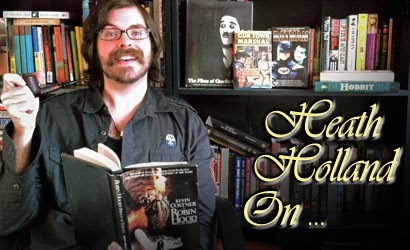 The legend of sleepy hollow is a Halloween staple for me as well. It's so terrifically spooky but also very funny and light hearted. The short little gal who attacks the two leads for a dance always has me busting up. I love mr toad as well, though I think his ride is better than his movie. Thanks for weighing in, Gabby! I really like The Adventures of Ichabod and Mr. Toad. When I was a kid that was always a "Safe Scary" movie that I enjoyed watching. And of course, it was a gateway to the Washington Irving short story later on.